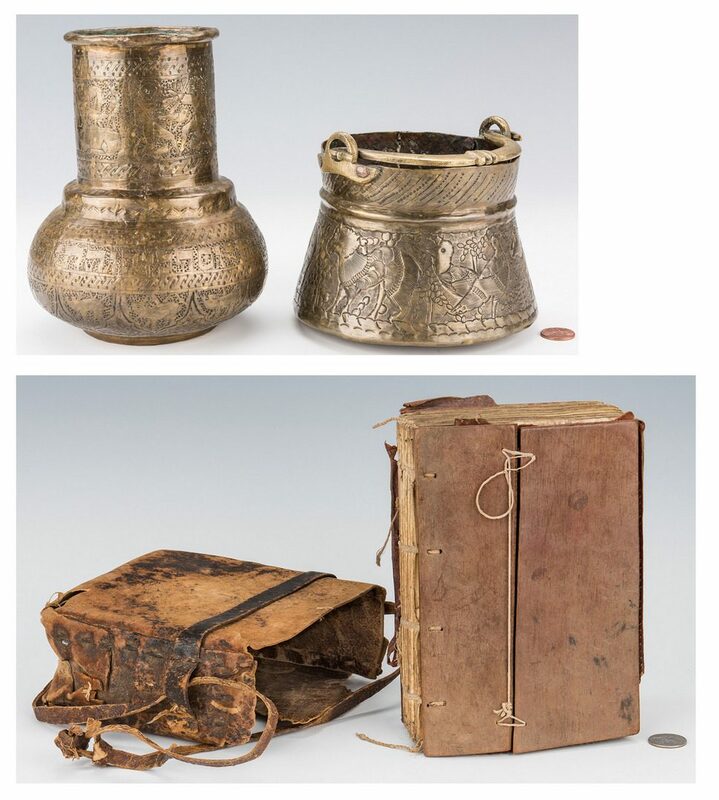 Two (2) Middle Eastern Brass Items and one (1) Ethopian Bible, 3 items total. 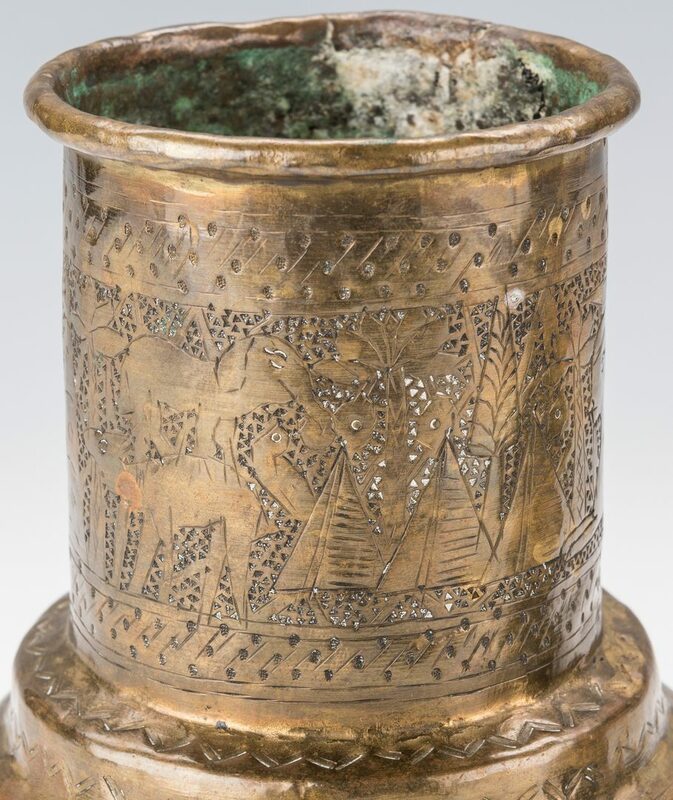 1st item: Egyptian gilt brass vase with repousse, punched and incised decoration including sphinx figures, figures engaging in battle and animals with a band of Hebrew letters to the lower body. 6 1/2" H x 5 1/2" W. 19th century. 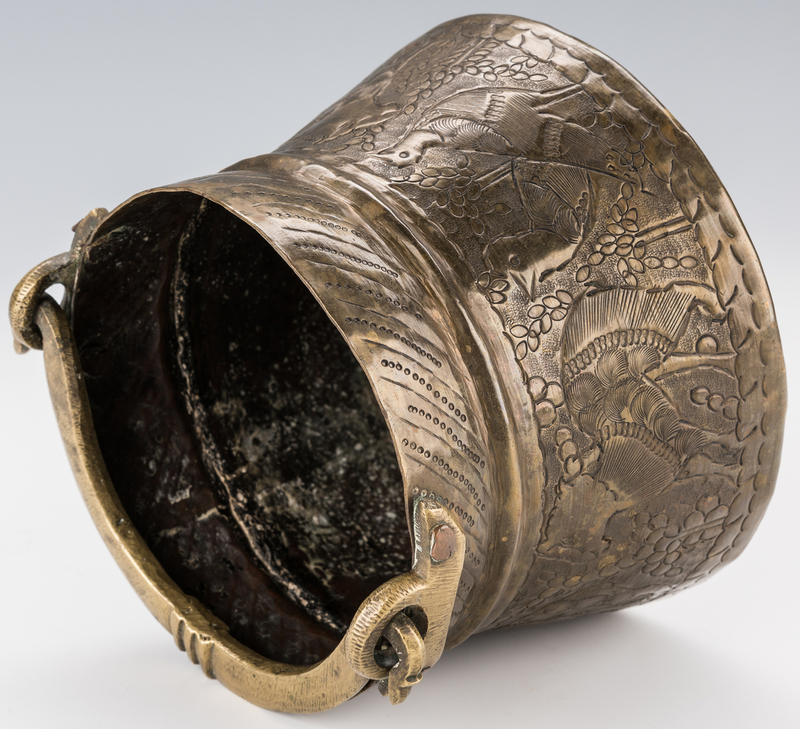 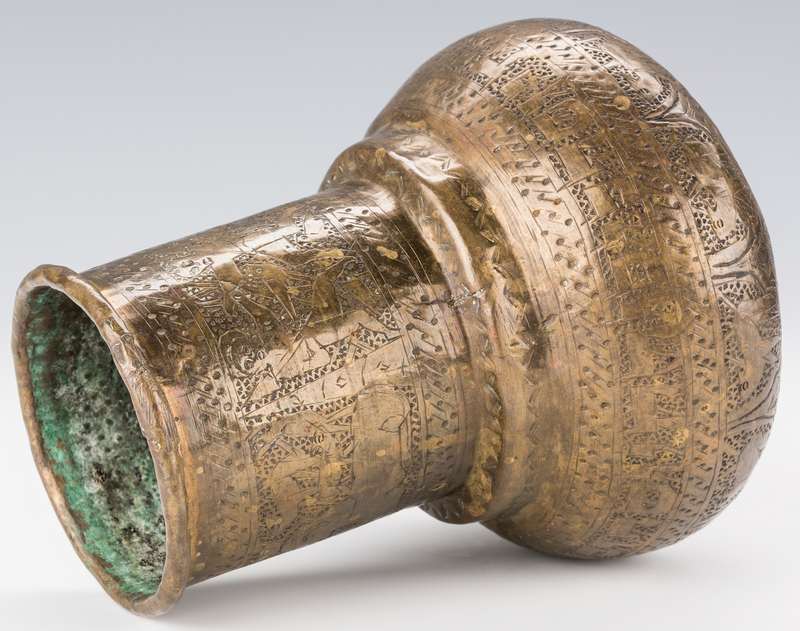 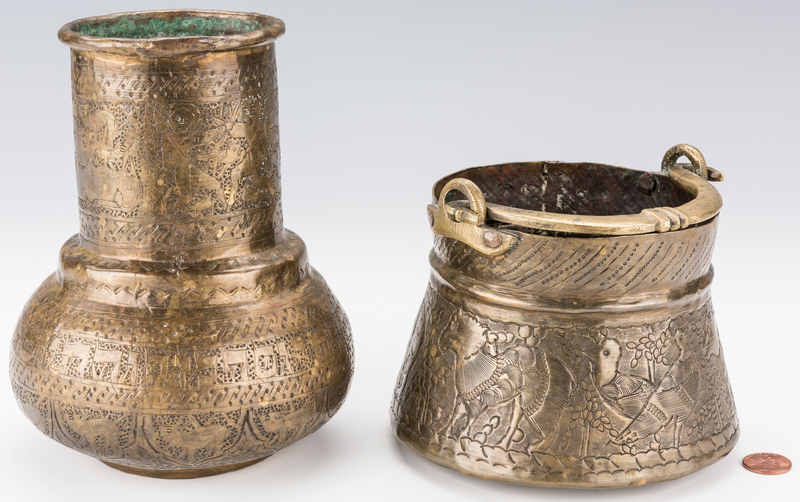 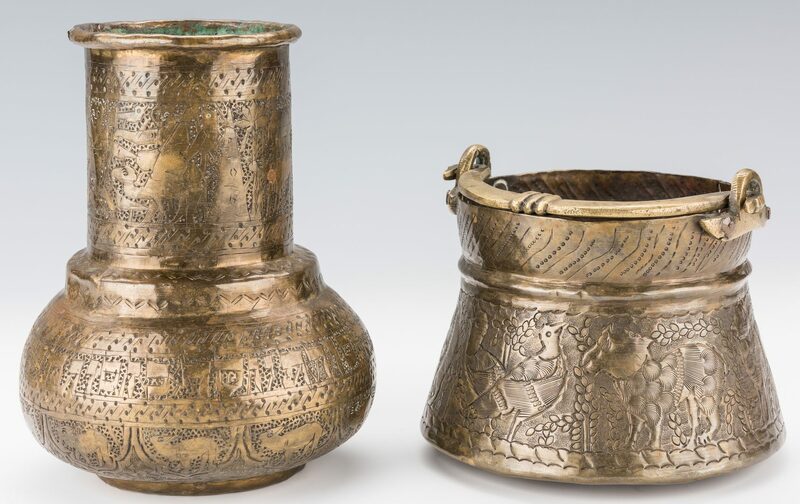 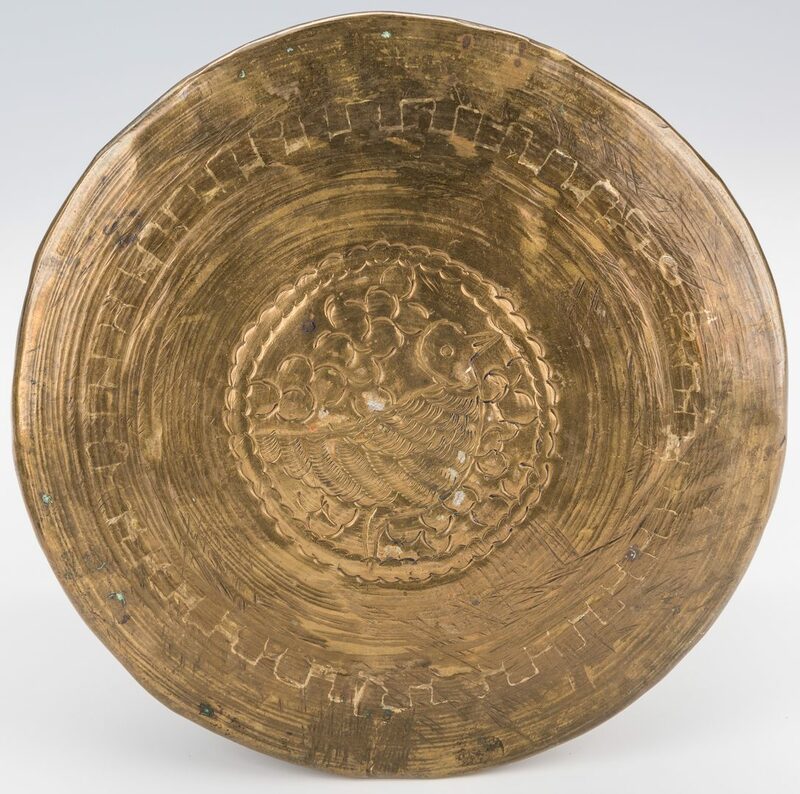 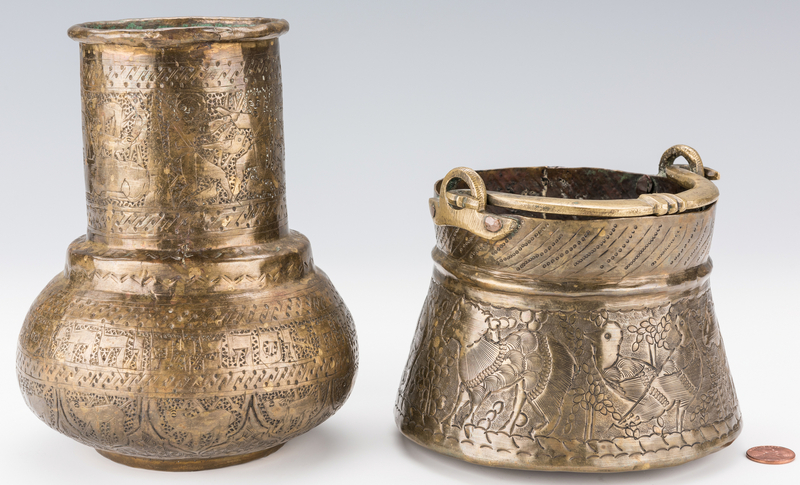 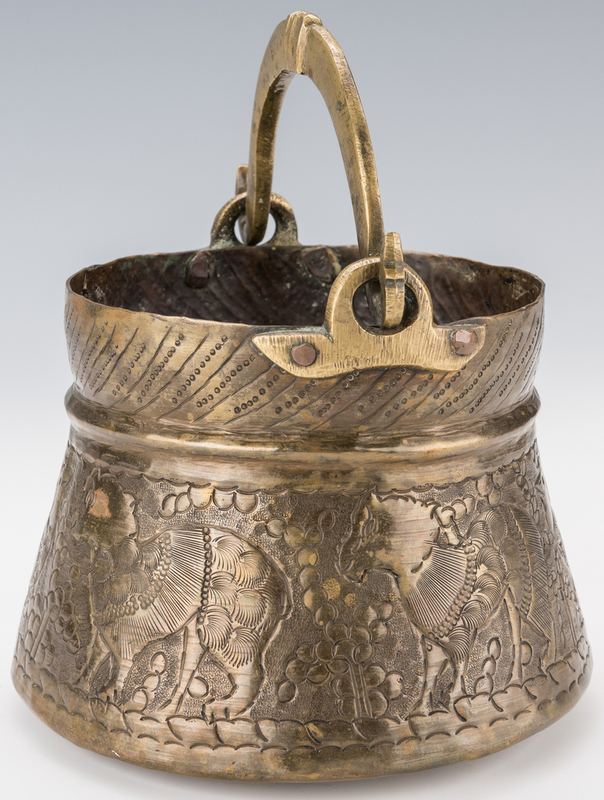 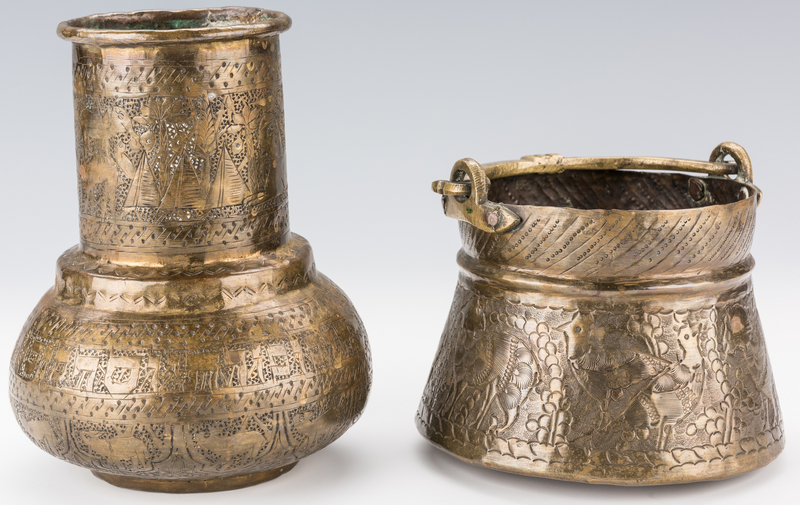 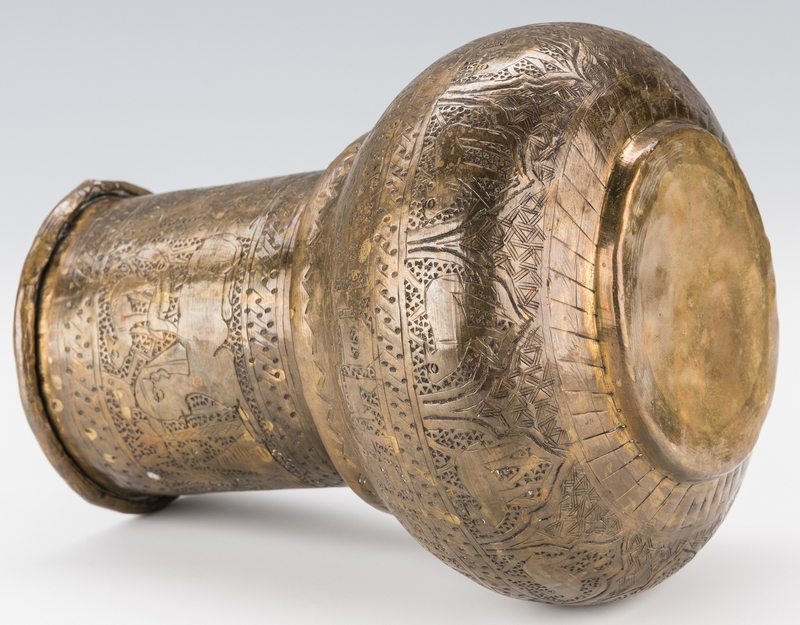 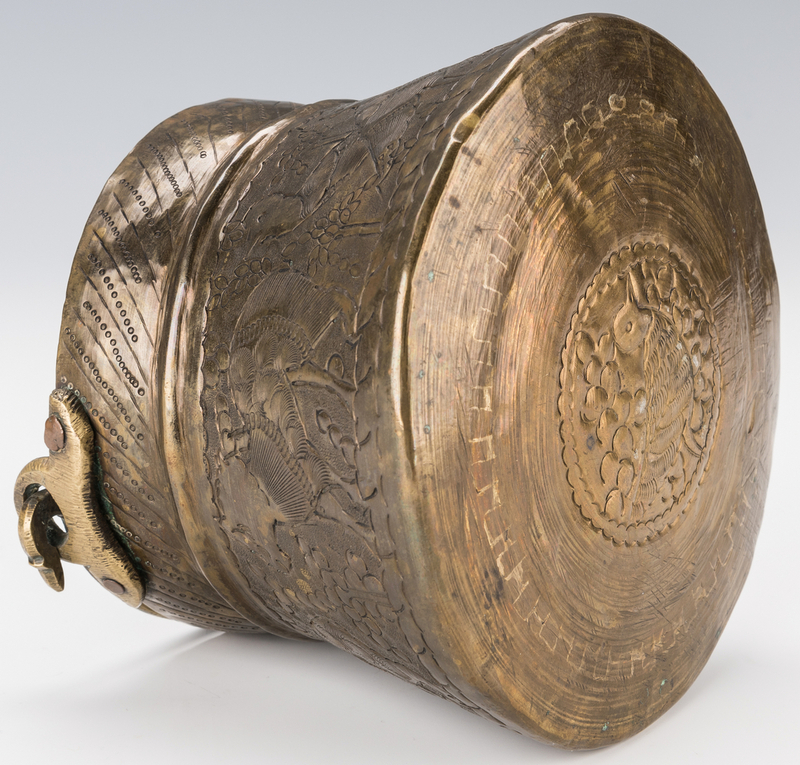 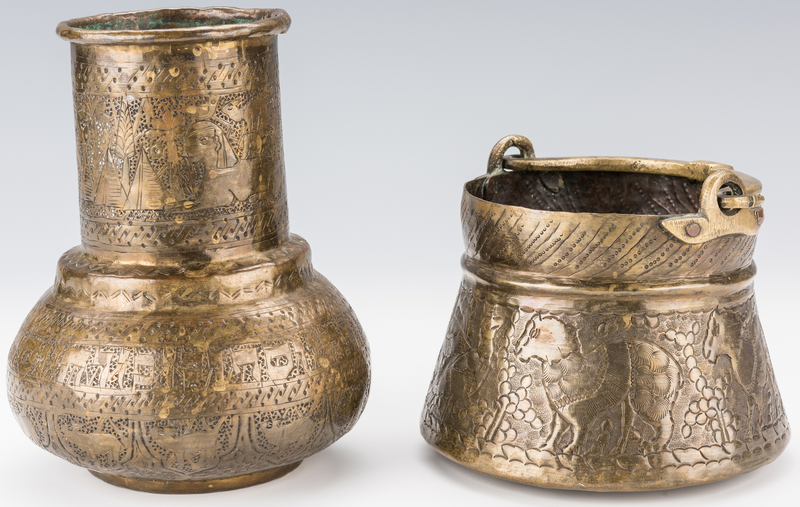 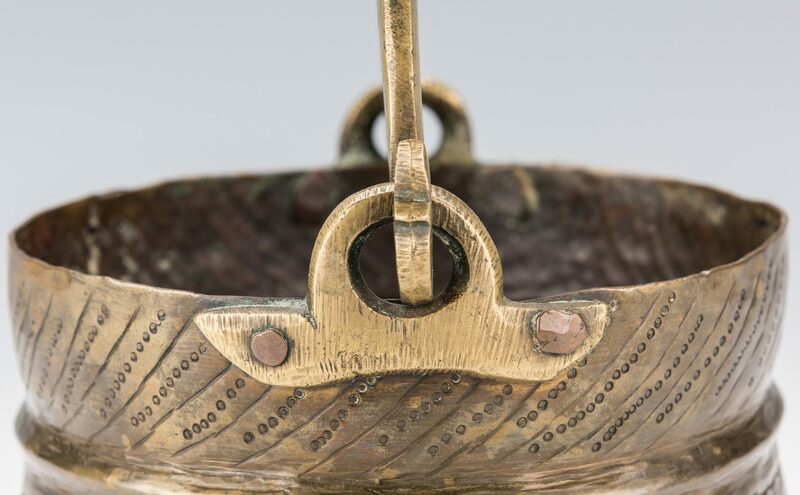 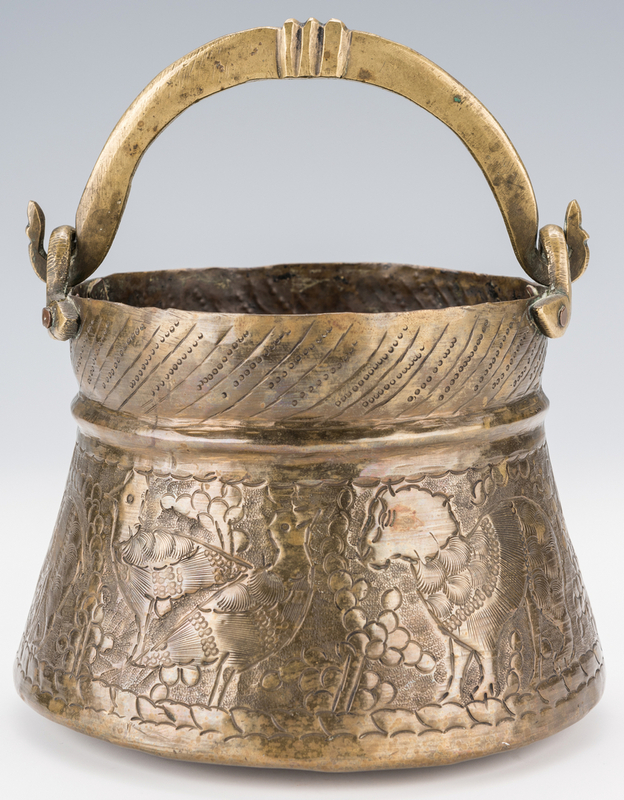 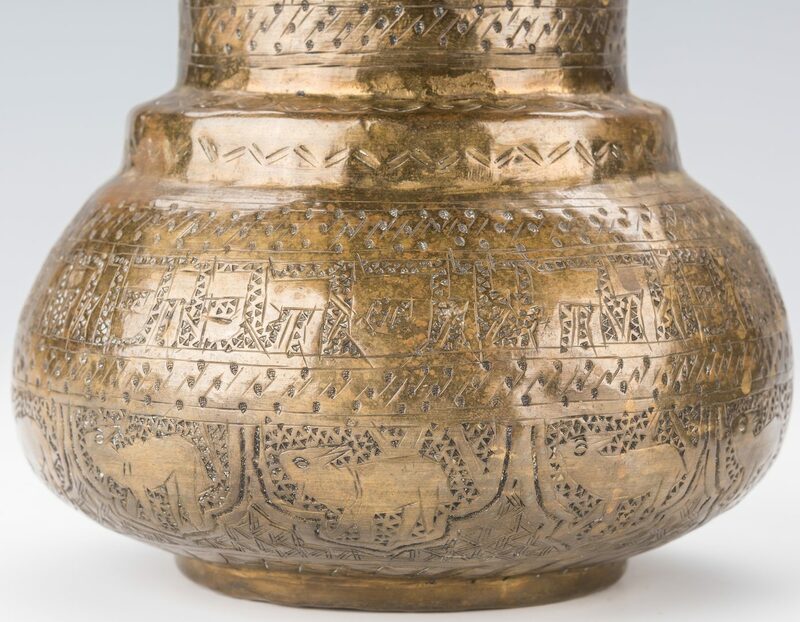 2nd item: Middle Eastern brass pot with repousse and incised decoration including animal and bird figures to the body and a bird figure to the dovetailed base and a shaped bail handle. 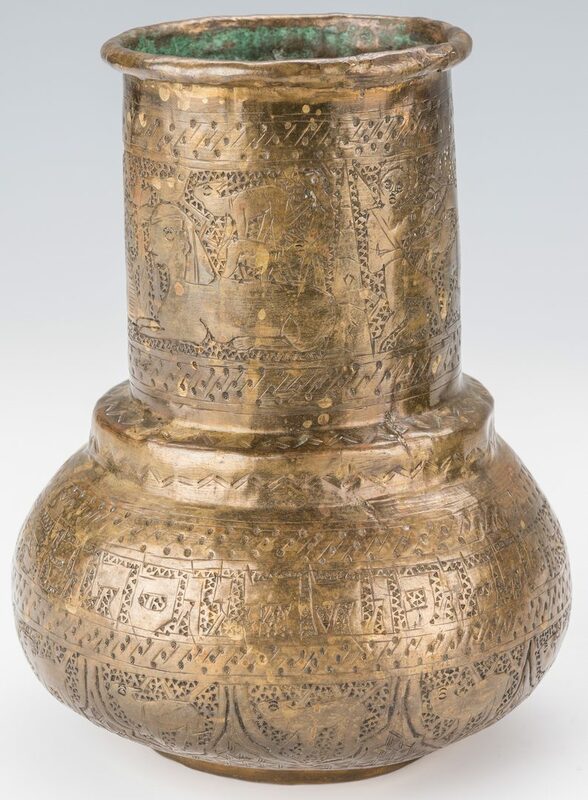 4" H x 5 1/2" W. 20th century. 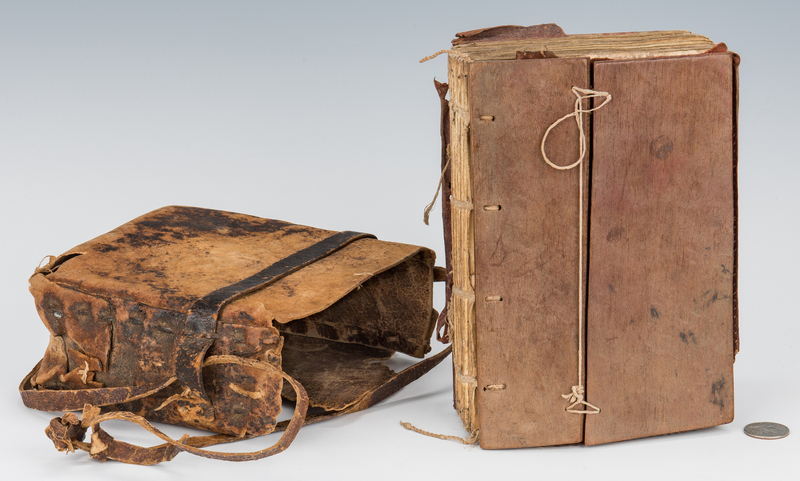 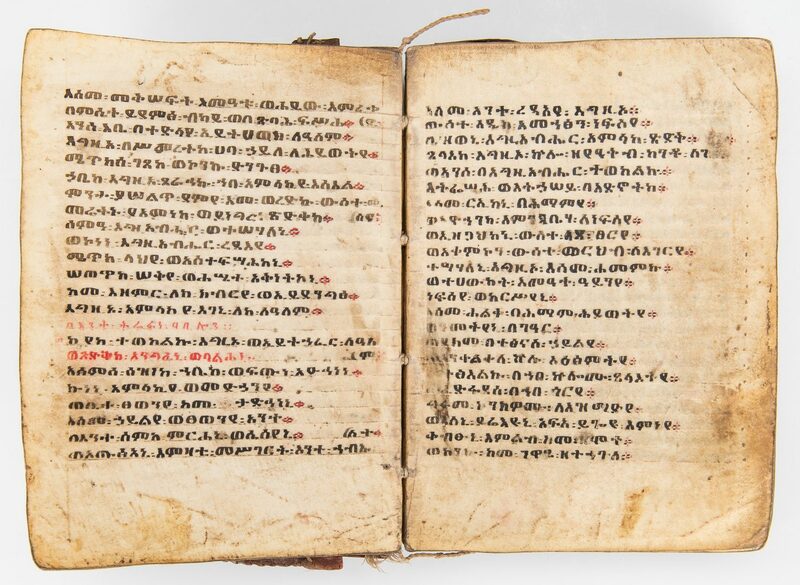 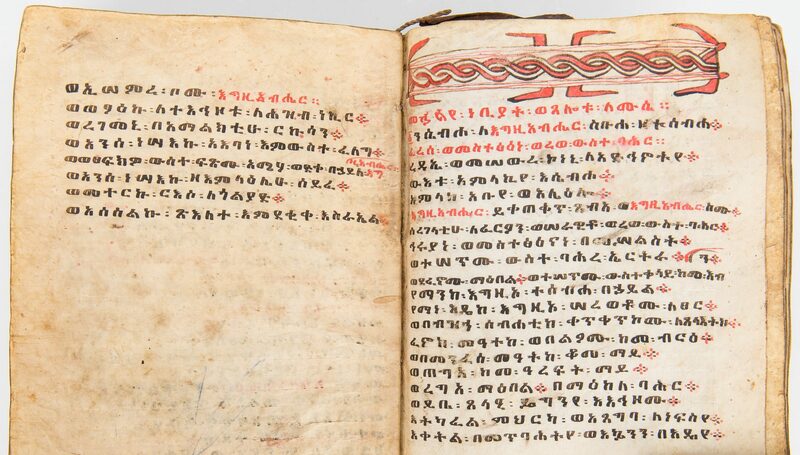 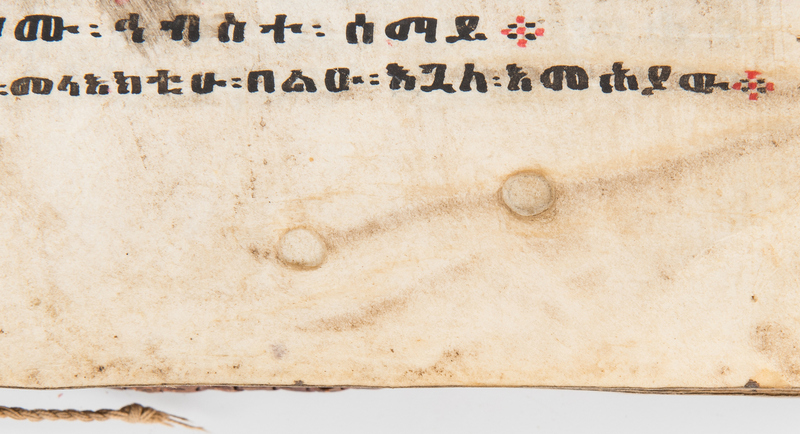 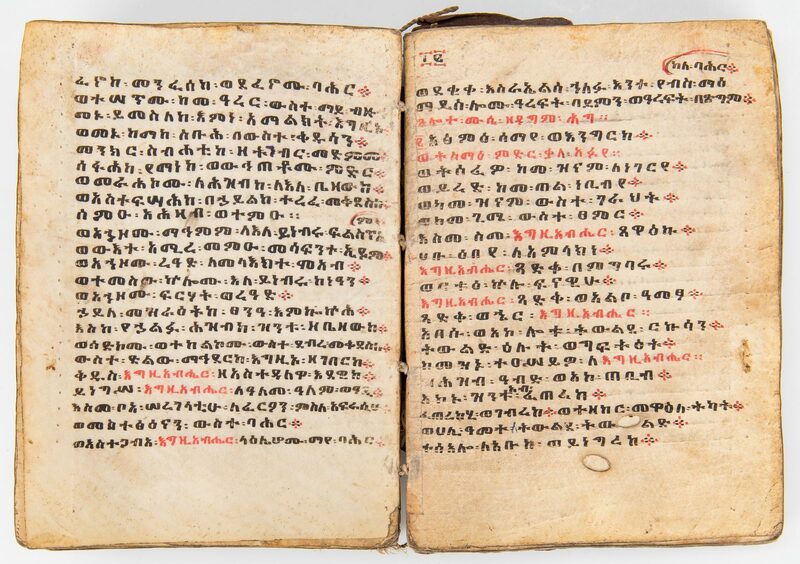 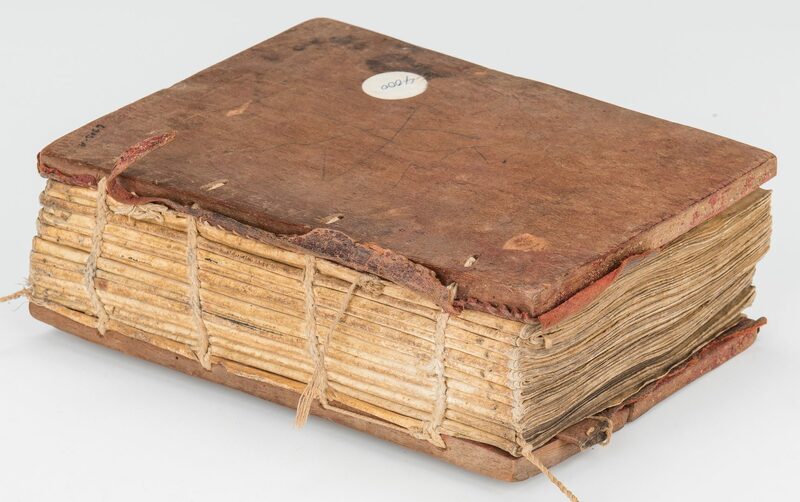 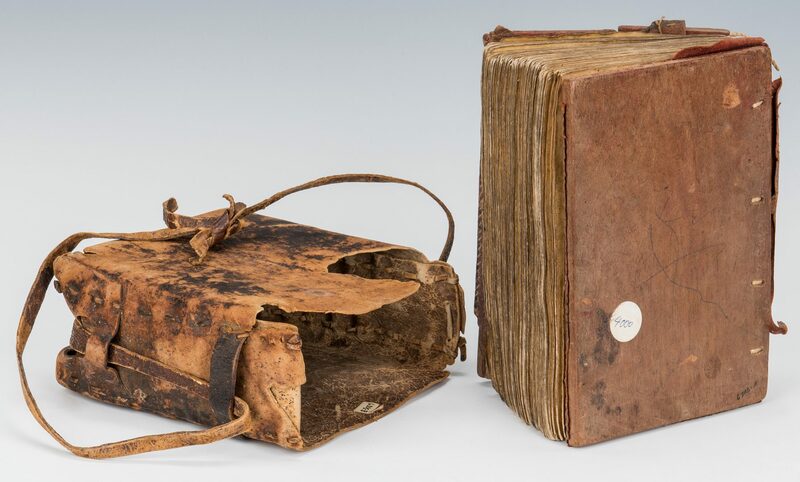 3rd item: Ethiopian hand-written bible, vellum pages, board covers with interior incised decoration, bound together by twine. 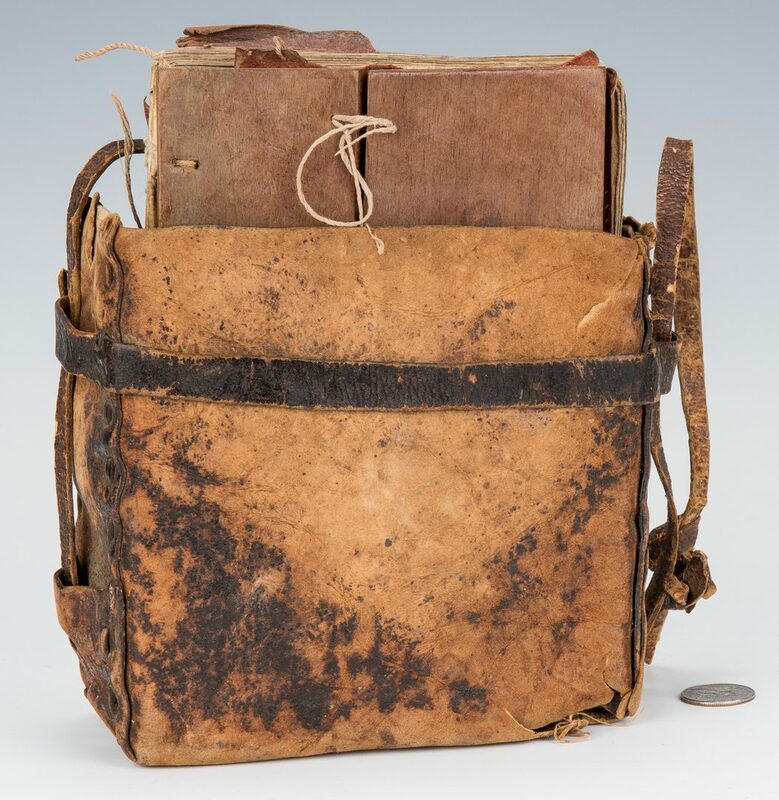 Includes a leather carrying pouch. 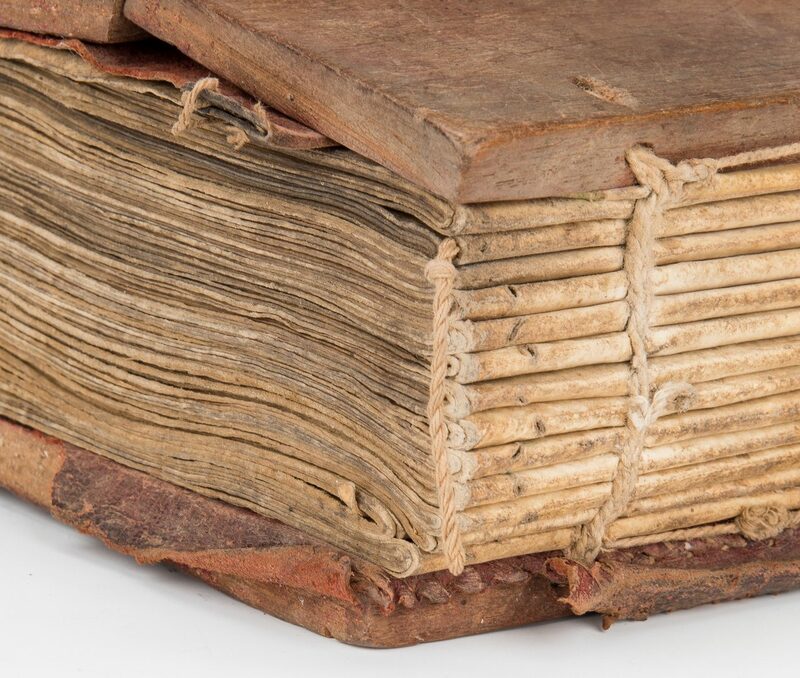 2 3/4" H x 7 3/4" D x 5 3/4" W. 16th/17th century. 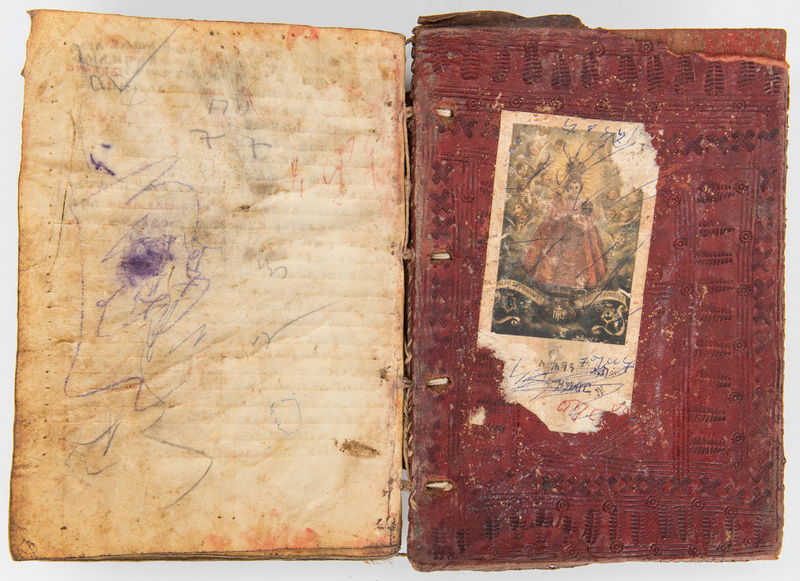 Provenance: Estate of Larry Casey, Jackson, TN. 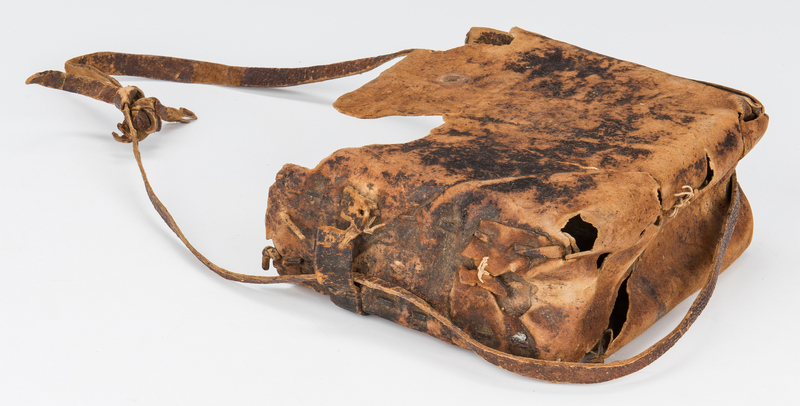 CONDITION: 1st item: Overall good condition with general wear to body, wear and old repairs to the rim, oxidation to the interior. 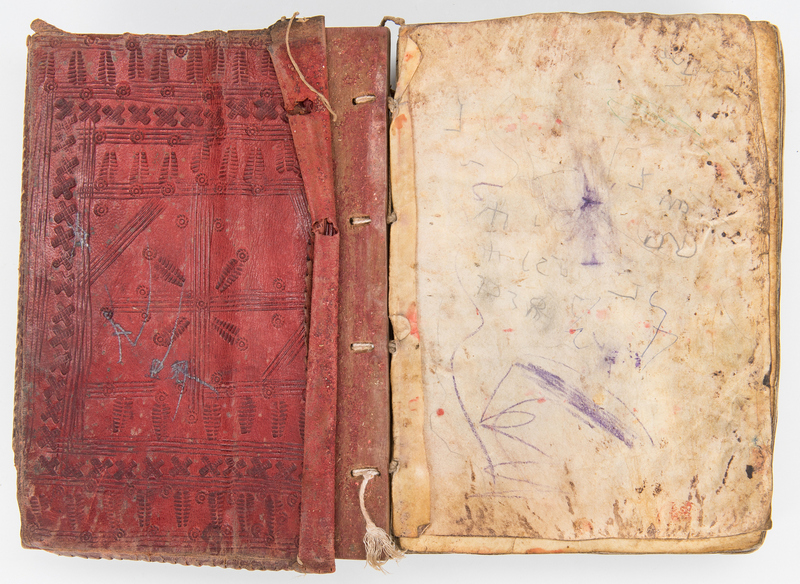 2nd item: Overall good condition with general wear to body, oxidation to the interior. 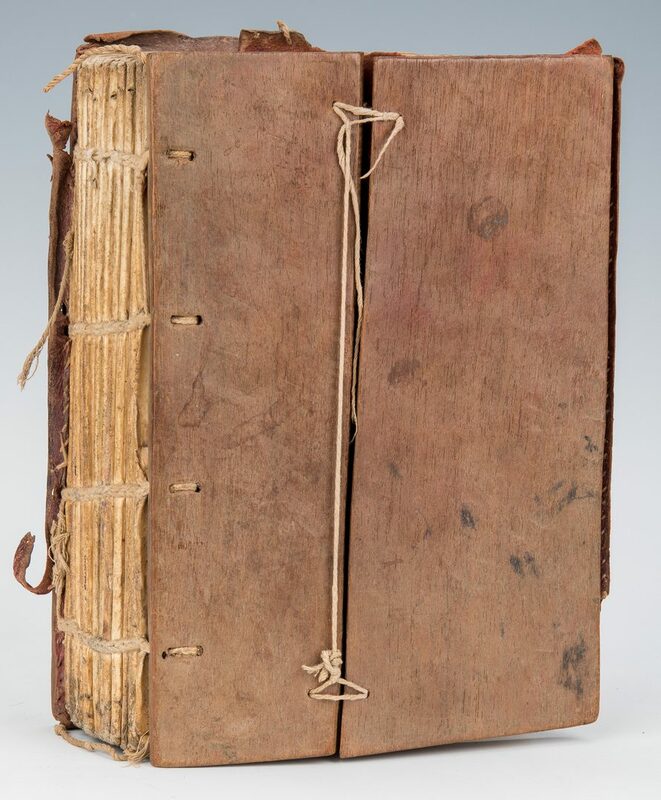 3rd item: Overall wear, errant marks to frontispage and back page. 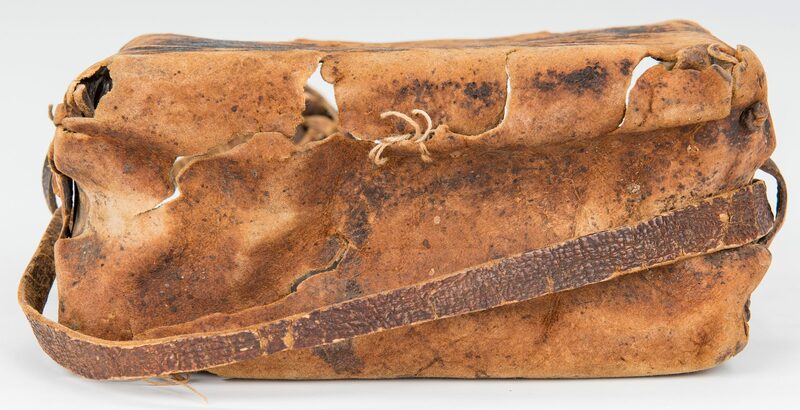 Wear and losses to leather pouch.